Phase One Industrial has launched the iXM series, an aerial camera platform driven by its fast medium-format imaging sensor. Engineered for UAV-imaging missions, the iXM 100MP is a high-productivity metric camera with a range of high-resolution lenses. It is ready for integration with various UAV platforms, including Phase One’s DJI Matrice 600 Pro solution. 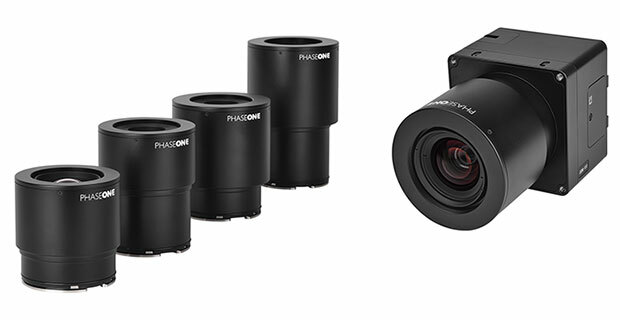 Also today, Phase One announced four new specially developed RSM lenses — with focal lengths ranging from 35mm to 150mm — to seamlessly fit the new sensor’s 3.76 μm pixel size and 33 x 44 mm frame size, ensuring image sharpness across the entire FOV. The lenses are available with either fixed-focus or motorized-focus functionality. The cameras’ RSM lenses incorporate a new leaf-shutter technology, which supports 3 fps capture — with a speed of 1/2500 sec — while guaranteeing 500,000 actuations. The lenses are thermally stable to ensure consistent focus over a wide range of temperatures and flight altitudes. With optics designed to exploit the full benefits of the new sensor technology, the lenses provide with greater productivity, flexibility and reliability, offering superb image quality. The new iXM platform adds XQD high-speed storage technology to handle the sensor’s extremely fast frame rate. Also on all cameras, HDMI output from actual exposure provides UAV operators simple and outage-free feedback of actual view, exposures, and camera status in overlays. In addition, the new platform includes USB-C and 10G Ethernet for versatility of connectivity to large UAVs and aircraft. The iXM 100MP and iXM 50MP metric cameras are available for advance order from Phase One Industrial partners worldwide with delivery in June 2018. 1 Comment on "Phase One launches cameras, lenses for UAV-based aerial imagery"